How does a cardiac monitoring service work? Cardiac monitoring providers offer physicians a way to measure a patient’s heart rhythm over a defined period of time. It is considered standard practice in diagnosing cardiac arrhythmias and is also helpful in evaluating and managing medications and their effect on a patient’s condition. When a patient is wearing a mobile cardiac telemetry device, the monitoring service continuously receives and observes the patient’s electrocardiogram. If any abnormality presents itself, the monitoring clinician will alert the physician in accordance with the signed notification criteria. A signed notification criteria is a physician-signed notification statement that details the type and level of irregularity and the protocol used to address it. When a patient has an episode that meets the notification criteria, whether the patient records it or it is automatically recorded via the auto trigger feature of the device, a clinician immediately processes the information and contacts the physician for further instruction. Those further instructions may include heading to the emergency room, the doctor’s office, or a simple adjustment to the patient’s medication. Holter monitors typically store recorded electrocardiogram data within the device and are not evaluated until the prescribed wear-time has expired. Patients return the Holter monitor to the clinic or the doctor’s office, where the information is downloaded to a secure server, analyzed, interpreted by the monitoring service and reported back to the physician for the diagnosis. As with event monitoring, if at any point an arrhythmia is identified, the physician is notified. However, a Holter monitor’s activity has already occurred and is being evaluated after the fact, while an event monitor’s activity is currently happening and can be addressed without delay. An event monitor, also called an ambulatory electrocardiographic monitor, is a battery powered, portable medical device that monitors cardiac activity as a patient goes about an ordinary day. The main purpose of an event monitor is to determine the cause of a transient event by recording a patient’s heart rate and rhythm during a period of time. In contrast to an EKG, which captures cardiac activity at one point in time, or a Holter monitor, which continuously records over a period of 24-48 hours, an event monitor records intermittently for a period of a few weeks, typically up to 30 days. It is typically prescribed because a prior method of monitoring failed to obtain necessary data, likely because the patient’s symptoms are unpredictable or infrequent, generally occurring less than daily. An event monitor allows for longer monitoring time and a greater chance of capturing an irregularity. A looping memory monitor, the most common type of event monitor, can be programmed to record ECG activity for a given period of time. When the patient experiences symptoms, he pushes a button to activate the device, which triggers the monitor to record the 60 seconds prior to the event, the event, and up to 40 seconds following. A post-event monitor is typically a handheld device or one that can be worn on the patient’s wrist, similar to a bracelet. The small metal discs that are located on the back of the device function as electrodes When the patient experiences symptoms, the monitor is placed on the chest and the patient activates the recording button. This records the current ECG activity. Unlike the looping memory monitor, however, a symptom event monitor will not store any ECG activity that occurs in the minutes prior to its activation. Both devices are able to send the ECG by telephone to a receiving center or a doctor’s office for review. Any emergency treatment, further testing or monitoring will be addressed as needed. Who is Reading Your Cardiac Data? 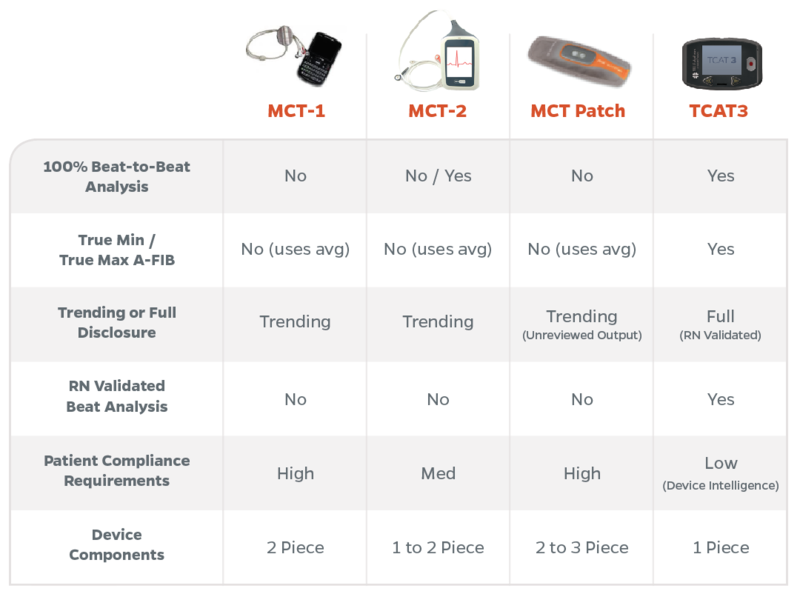 There are many variables to consider when selecting a cardiac monitoring service. Each provider has their own mix of technology, process, and service. While the type of technology used to capture patient data is critical, it’s even more important to know who is reading the data. This basic level of monitoring is managed by the reliance on algorithms. It is an automated system that alerts the monitoring company of any abnormality based on specific criteria. Generally, a raw, unedited report is sent to the physician for evaluation and interpretation. With this method, the physician’s office retains the responsibility in terms of analyzing the data in a timely manner. Many monitoring services are staffed with Certified Rhythm Analysis Technicians (CRATs) and/or Certified Cardiac Technicians (CCTs). These technicians have experience with administering EKGs, and reading and troubleshooting reports. Comparable levels of technicians include those who may have attended a monitored technician course in order to learn how to interpret EKGs or those who may have been hired by the monitoring service and are provided with on-the-job training. The highest level of cardiac monitoring reading expertise includes a combined staff of registered cardiac nurses and technicians. Registered nurses are college educated, state board certified and, in many cases, certified in additional specific areas of expertise. Registered nurses generally bring with them years of valuable critical care experience. Their ability to leverage that experience while watching and analyzing EKG results and evaluating their patients’ signs and symptoms adds significant value to the overall monitoring service. Their expertise allows them to serve as an extension of the physician as they ask critical questions and provide comprehensive care and comfort by way of a more holistic approach. Cardiac monitoring providers offer distinctly different levels of service when it comes to who reads the data. When evaluating these providers, determining who is caring for the patient is a critical component in the decision-making process. Any monitoring partner you utilize is an extension of your patient care, so it’s important to choose one that not only meets your outsourcing needs, but also your standards and level of patient care.